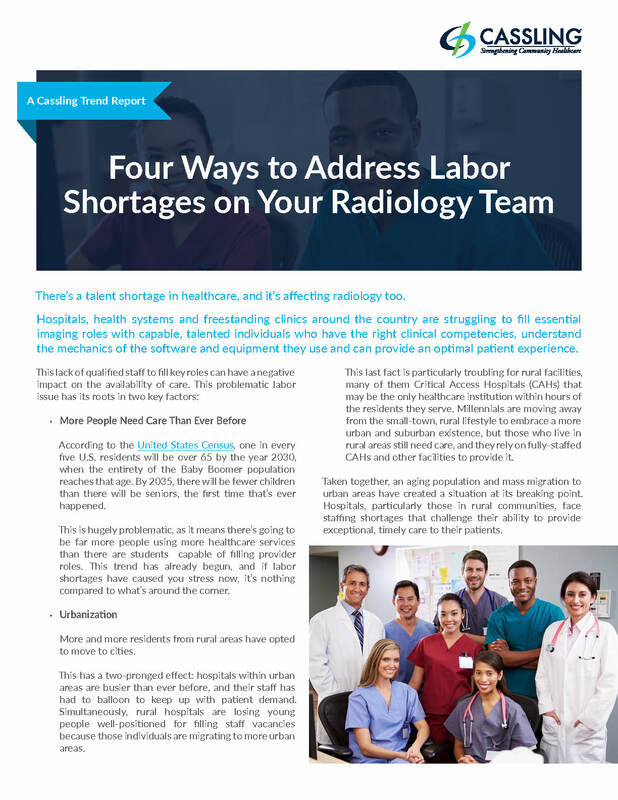 There’s a talent shortage in healthcare, and it’s affecting radiology too. Hospitals, health systems and freestanding clinics around the country are struggling to fill essential imaging roles with capable, talented individuals who have the right clinical competencies, understand the mechanics of the software and equipment they use and can provide an optimal patient experience. In this Cassling Trend Report, we’ll review the main reasons why there's a severe talent shortage and explain the four ways that facilities of all sizes can attract qualified individuals to join their teams. Fill out the form to download the Trend Report! Cassling, founded by Bob Cassling in 1984, is an Advanced Partner with Siemens Healthineers. As a family-owned company, we're dedicated to strengthening healthcare in local communities. Copyright © 2019 Cassling. All Rights Reserved.